These are the premises of an accountancy firm. An ordinal profession, in a framework, fixed within a context of mathematical management - welcome to an institutionally scientific style. We were dealing with 3 partners who wanted to give more soul to their premises, aiming to offer a setting of well-being for their 120 employees, and to welcome loyal or potential clients to a world of colour which exudes dynamism and takes the firm out of the stereotype of an ordinary accountancy firm which everyone sees as old-fashioned, sad and totally uninteresting. The 3 partners are all sportsmen, seeking a new dynamic for their new brand image, and they called on our services. Soraya DEFFAR took note of, and understood, the words: chartered accountancy, legal advice, assets management, development and profitability: a lot of ROOM for work. She understood the figures here, the Men, the buildings, the spreadsheets and she associated with them a more global version which was to be the motto for our approach: CONFIDENTIALITY. 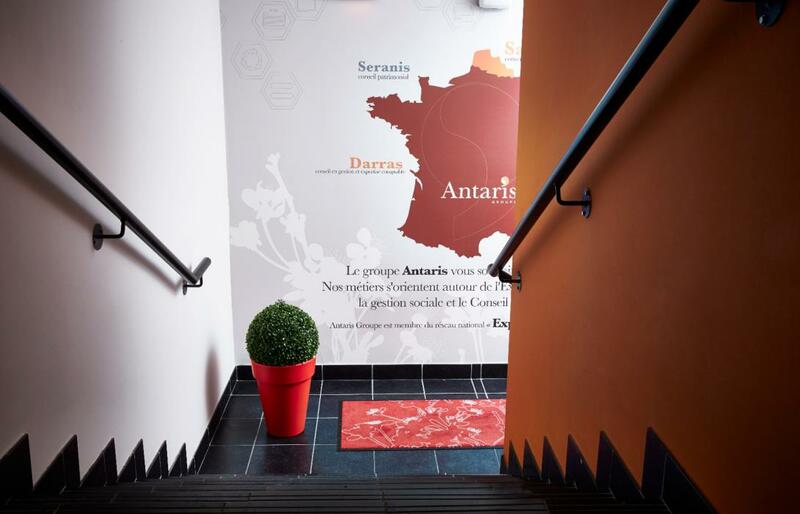 With an existing graphic charter, the logo of the Antaris Group comprises a modern graphic illustration and contemporary typeface. The two colours used are brick red, with its connotation of the North region, where the group was first established, and mineral blue, representing peace, calm and serenity, but we see it as infinity. 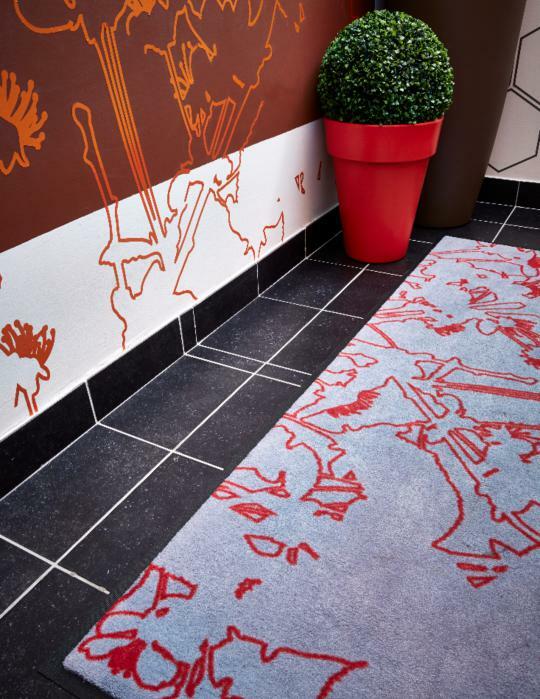 To give life to a resolutely more decorative style, we worked more with tangerine orange. The colour orange represents daring, radiation, intelligence, loyalty, warmth and both confidence and mistrust. This chromatic triptych was used as a real driving force for our creative approach, bringing energy and modernity to the concept. 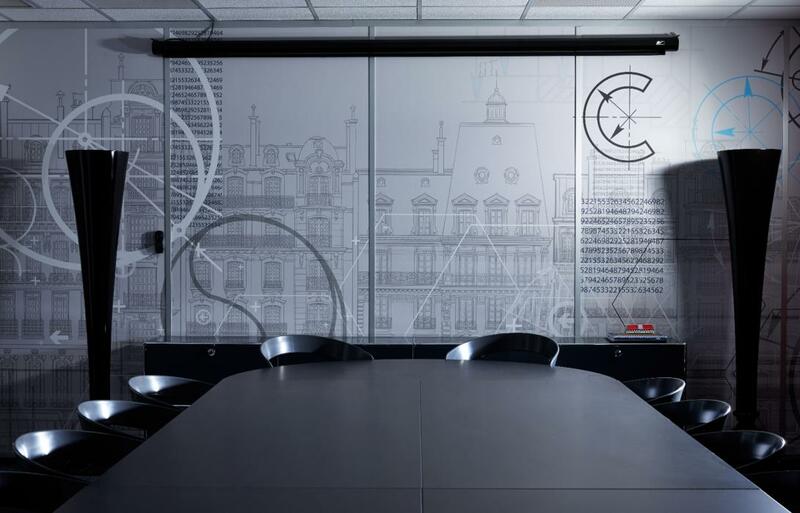 In graphic terms, our mural design mission works around carefully calculated signage, using round shaped illustrations to break away from any hierarchical setting, with swirls and arabesques. 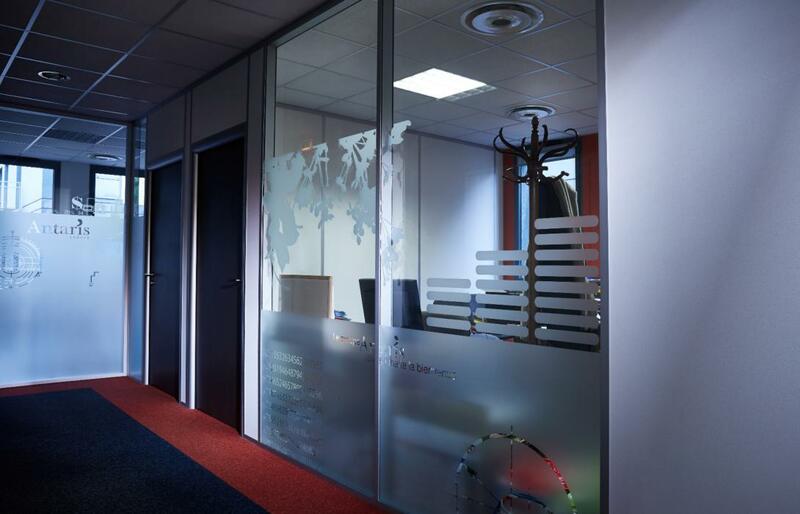 Therefore, right from the entrance hall, the common spaces on the various levels guide you in a fun, attractive way to the people you need to speak with. 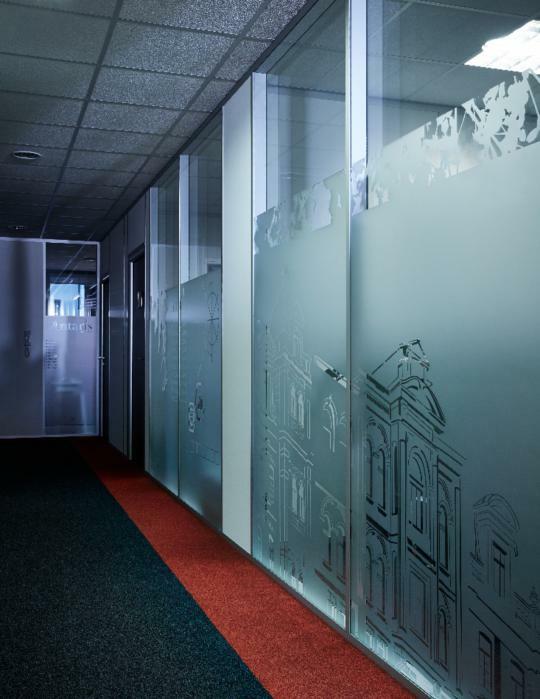 The common spaces with their transparent glass partitions have been given open-worked stickers with lively illustrations, acting like a journey of initiation throughout the premises, whilst their opacity guarantees the security and confidentiality of information in the offices and contains illustrations of our clients’ work. For the furniture we used some great design references, note the rich composition of USM modular furniture. For a maximum of femininity in a place that breathes “male”, we have used the famous MISS K designed by PHILIPPE STARCK produced by CARTEL. 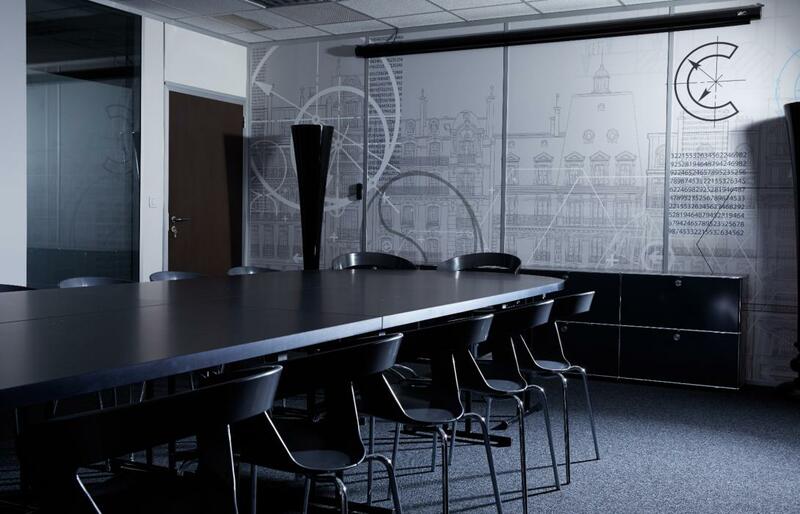 In terms of interior decoration, a lot of work was done on volumes and proportions, with a table designed and made to measure that can take a meeting of over 40 people. For more modularity, CASAMANIA chairs on stainless steel casters are used in this attractive setting. 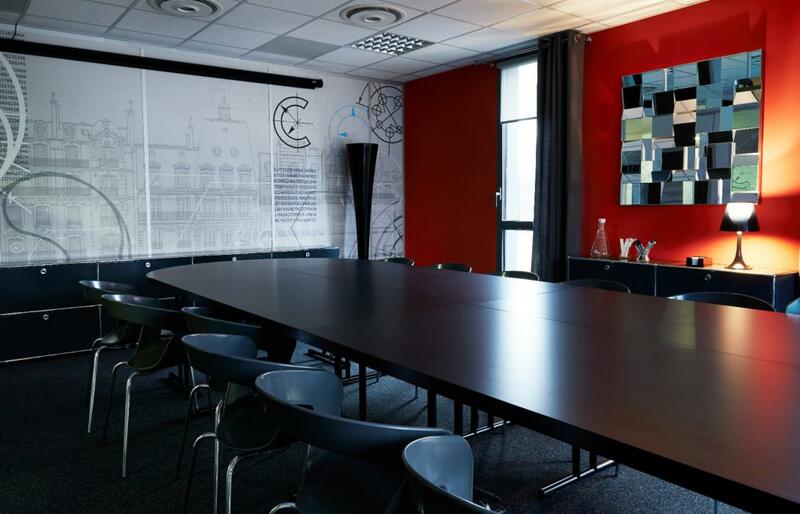 The 100m² room has been made entirely modular; it can now be turned into a meeting room, a conference room, an open space or a gym. 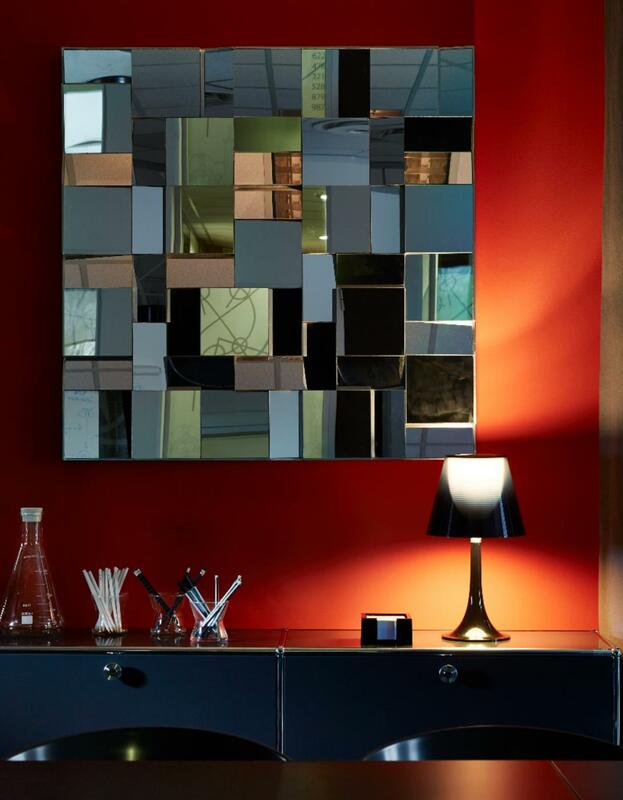 To ensure that modernity is taken to the limit we have used shades of grey here, now light, now dark, depending on the various materials involved: the resin of the chair seats, lacquer textures and multi-facetted mirrors as if, all at once, the “Executive” comes out of his shell. Accessories, mainly book covers and office supplies, are staged in an experimental cabinet, as if in a scientific laboratory. Bayadere stripes and graphic motifs are what brings fantasy in here. The windows have also been adorned with textiles: opaque blinds to filter out UV rays during projections on the big screen, and thick curtains in natural materials to warm up the décor and give it a still more confidential feel. We’re a long way from the rigour of accountancy! As for the limit, there isn’t one … and the calculation is just right!